Find Out Where Your Data is Going! MySQL Explained is a clear, step-by-step presentation of MySQL, from installation on Linux, Windows and Mac OS X, through the design of everyday database applications. You’re new to MySQL or database design in general and need to learn the tools. Basic knowledge of database design can make you the one person in the office who can tackle that important project. You work with database designers regularly and need to do it more effectively. Even if you never design a database yourself, knowing the principles involved will save you a lot of misunderstandings when asking for new reports or system enhancements. You work with large amounts of information on a regular basis and would like to know how to organize and understand it better. Whether you’re an accounting professional trying to make sense of expense data or an administrative assistant putting together a database for inventory information, an understanding of how databases work will enable you to produce better results and save you work in the long-term. Finally, you’re an I.T. professional, maybe even a programmer or software developer, who is still not sure of the details of database design or MySQL. Maybe you’re just coming back to it after years of doing other work and need a refresher course. Having a reference by your side can be very helpful when working on your latest project. is available now on Amazon.com and LeanPub.com! Reviewed and updated in March 2016 with instructions for OS X El Capitan! Available in paperback and for all eReaders! 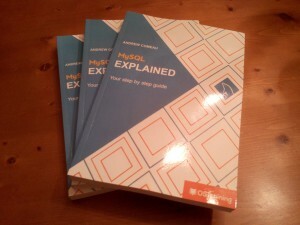 Whether you prefer eBooks or paperbacks, MySQL Explained is available in the format of your choice from both LeanPub.com and Amazon.com. 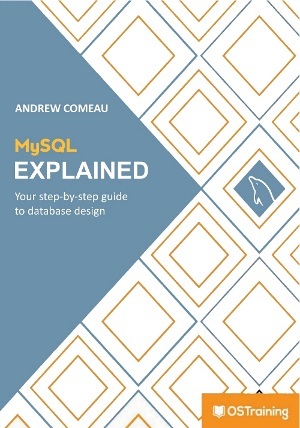 Find it on Amazon.com (Kindle and paperback edition) – MySQL Explained is available on Amazon.com in both Kindle and paperback editions. Download a sample or the entire book straight to your Kindle or order the paperback edition, whichever best suits your needs. Find it on LeanPub.com (Kindle, EPUB and Adobe PDF editions) – LeanPub.com is an independent publishing website through which authors can publish and sell books in multiple formats. LeanPub encourages authors to “Publish early, publish often.” which enables readers to follow works in progress and be informed when updates and corrections are issued. LeanPub.com‘s model also enables us to offer MySQL Explained to you at a 10% savings over other sites and an even larger savings over the paperback edition! Payment can be completed through PayPal or through LeanPub’s secure payment portal. Available in your choice of electronic editions on LeanPub.com! Now available in paperback and Kindle format on Amazon.com.